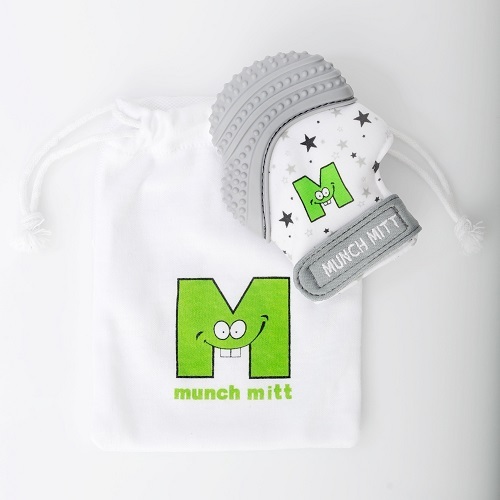 North America’s top baby teething mitten will help end the teething toy trail. 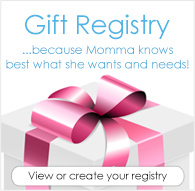 Mom invented, natural teething remedy that babies and parents love. Great for travel in the car seat or stroller! Do not sterilize in microwave. If dishwasher is used, place on top rack and do not keep it on heat/steam dry cycle - this will damage the mitt. This is genius! My son loves chewing on this and I don't have to worry about him dropping it while he still learns to control his hands. The only thing I don't like is that he makes a fist when I put it on so it's kind of difficult. My now 6 month old son has had his munch mitt (in aqua) for about a month now and it’s excellent! There’s crinkle paper in one side, so it makes a fun noise when he’s playing with it, even if he’s not nomming in the nubby silicone. The strap helps it stay on quite well and also gives him something else to occupy his time - trying to take the mitt off. 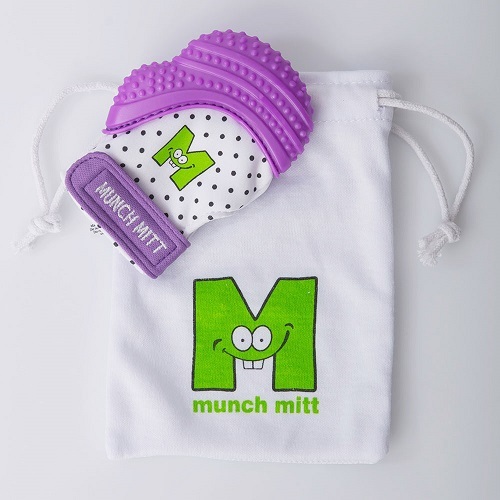 It comes with a genius pouch that is mesh-like, so not only does it keep your mitt clean when not in use, but it allows air to flow through, drying out the mitt for the next slobber fest! I washed it with mild dish soap and hung on the bottle rack to dry after thoroughly rinsing all the suds out and it did take quite a while to dry, so just be prepared for that. My little guy just turn 3 months and his hands live in his mouth. He doesn't have the coordination to bring toys to his mouth so this mitt works great! Definitely recommend it!